After early morning breakfast proceed for a game drive in L.Nakuru National park known for it�s millions of flamingoes and other water birds. Leave Nakuru after lunch for Nairobi arriving mid or late afternoon for overnight a Nairobi budget hotel. Day 5: Nairobi - Arusha . Pick up from your hotel in Nairobi at 7.30 am depart for Arusha town via Namanga border post for immigration formalities then proceed to Arusha arriving early afternoon to be met by our staff followed by safari briefing, overnight at Arusha budget hotel. Pick up from your hotel in Arusha at 8.30 am leave for L.manyara National park arriving in time for lunch with afternoon game drive, dinner and overnight in your campsite. After breakfast, leave lake manyara for ngorongoro crater arriving in the afternoon, descend 2000 ft (670m) into the crater floor for full day crater tour with break for lunch at Ngoitoktok springs picnic site. Black manned lions, rhinos, buffaloes, elephants and other grazing animals abound. Evening game drive, return to Ngorongoro wildlife campsite for dinner and overnight. Morning and afternoon game drive in the Serengeti with a lunch and leisure break at the lodge or campsite in the mid afternoon .The term �serengeti� means endless plains in maasai language. In the central plains there are carnivores like, leopards, hyena and cheetah. This park is normally the scene of the annual migration of the wildebeest and zebras, which occurs between Serengeti and kenya�s maasai mara game reserve. Eagles, Flamingoes, duck, geese, vultures are among the birds that can be seen in the park, Dinner and overnight in your campsite. 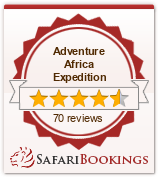 Day 10: Serengeti - Tarangire.